Aix-en-Provence is a town 25 kilometres north of Marseille and to the south of the villages of the Luberon in the Bouches-du-Rhone department of Provence. 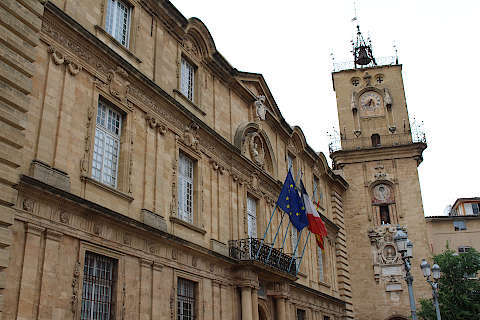 The town is listed as one of less than 100 important Historic Towns in France. 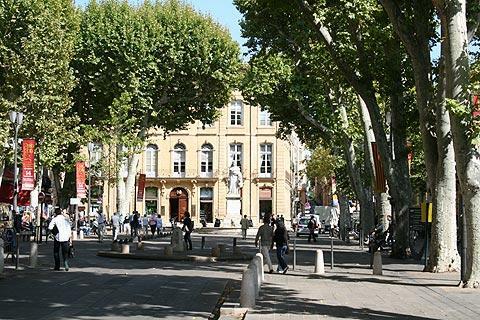 Aix has its origins in ancient times when it was a Celtic capital, then becoming an important Roman town in the 2nd century BC. 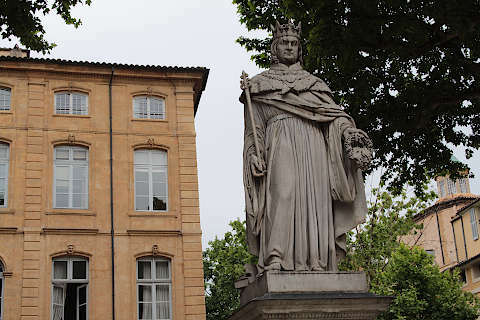 At the end of the 15th century Aix was the capital of Provence under the successful leadership of King René and several of the buildings and highlights of the town date from this period of prosperity. This period ended in the 16th century with various political disputes, followed by great suffering for the residents during the Wars of Religion. 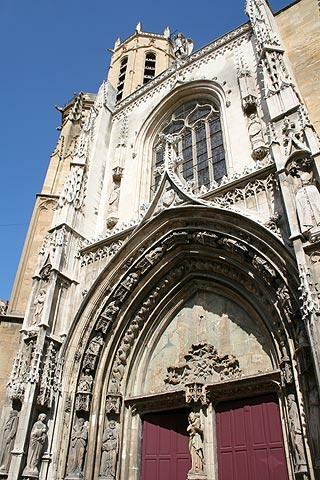 A second time of great prosperity for the town, also reflected in its architecture, was during the 17th-18th centuries. 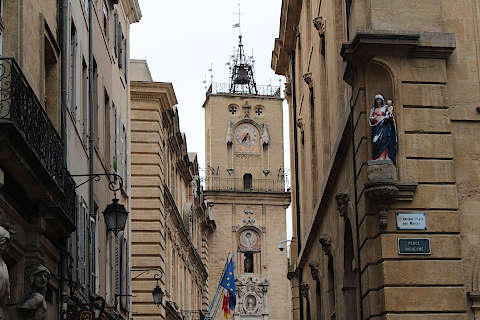 France This Way comment: Aix-en-Provence is a lovely town with lots to see and do, including various museums, so we suggest you spend a night or two here if possible rather than just make a quick 'day trip' visit. Aix-en-Provence is a vibrant, lively town with a university founded during the golden era of 600 years ago, and has all you would expect in a Provencal town - sunny squares filled with cafes, broad avenues lined with plane trees, and a substantial historical centre lined with boutiques and attractive houses...and more cafes. 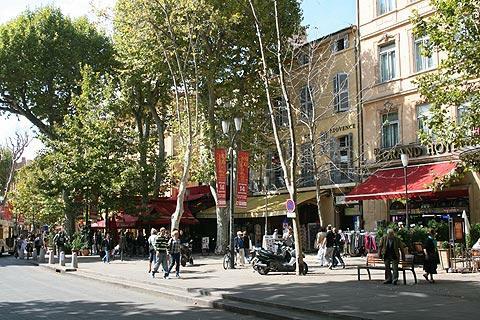 Your visit will start along the main thoroughfare in the town centre, the Cours Mirabeau. 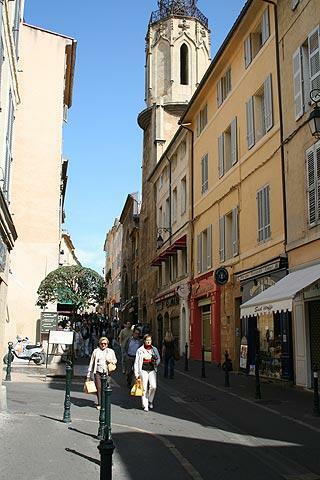 This broad street runs east to west through central Aix-en-Provence, and is lined on both sides with grand houses built during the 17th-18th centuries. 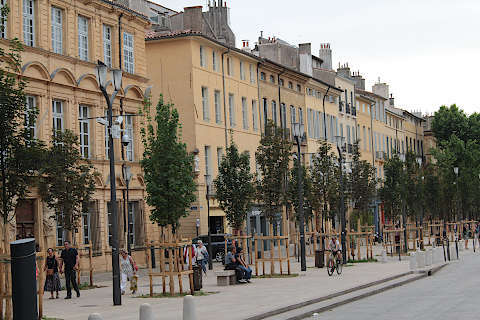 You will find that the most imposing houses are on the southern side and most cafes and other activity on the northern side of Cours Mirabeau - and the trees that provide the shade for the cafes stop you seeing both sides together very easily, so you will need to allow time to walk the street in both directions. It's a lovely street (perhaps not quite the Champs-Elysées but certainly one of our favourite avenues in the south of France) so this isn't too much of a hardship! The Rotunde (in the middle of a busy roundabout) is the largest, with lions around the base and statues above. The Mossy Fountain, so-called because it's covered in moss! (Although the fountain of nine canons is also covered in moss). Elsewhere in the town centre you will come across lots of other fountains. 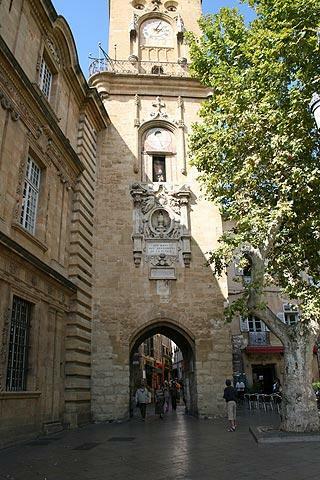 Running north off Cours Mirabeau from near the Fountain of King René is a very narrow alley called the Agard Passage. 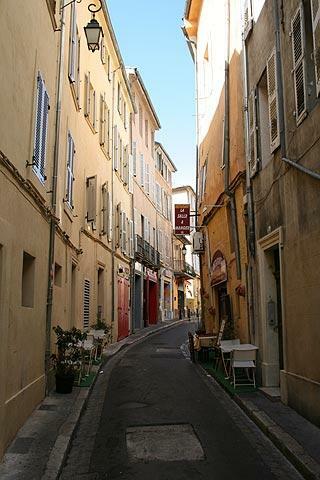 This alley is said to contain a cafe which Cézanne frequented called 'The Deux Garcons'. I searched the alley and failed to find it but I am assured it is there! 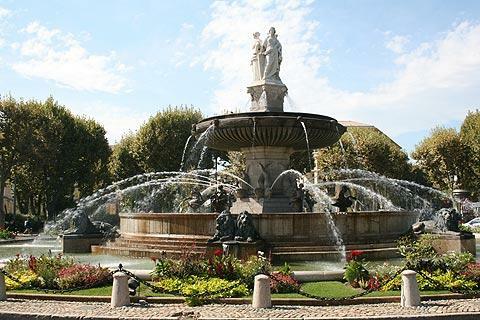 The main historical town centre of Aix-en-Provence is the area to the north of Cours Mirabeau around the town hall and cathedral, and south of Cours Mirabeau around the Place des Quatre Dauphins and its 17th century fountain. 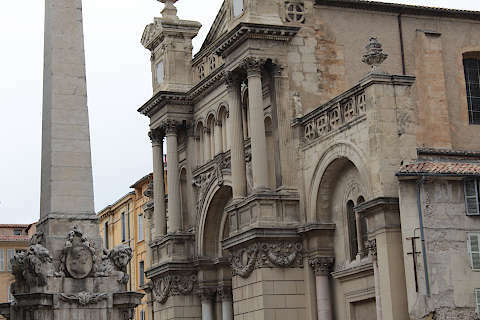 You will also notice that there is a great deal of Baroque architecture - in fact there are more Baroque buildings in Aix than any other city in France except Paris and Versaille. There are various sights to enjoy but it is the overall setting and ambiance that is really the main appeal. 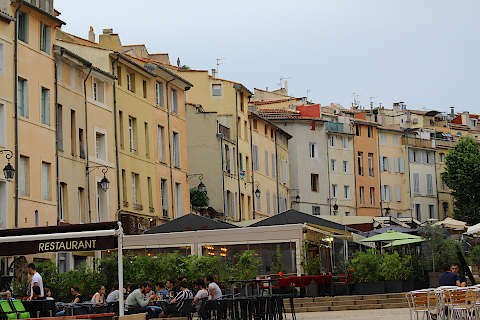 In this region of Aix-en-Provence there are a great number of attractive streets, often with grey-shuttered, pastel-coloured houses and many of them now converted at ground level into shops, cafes and boutiques. The Town Hall, an ornate 17th century building with an Italian style facade. There is also a very impressive 16th century clocktower near the town hall. On Saturdays, Tuesdays and Thursdays the square in front of the Town Hall holds a popular flower market which is a lovely sight. 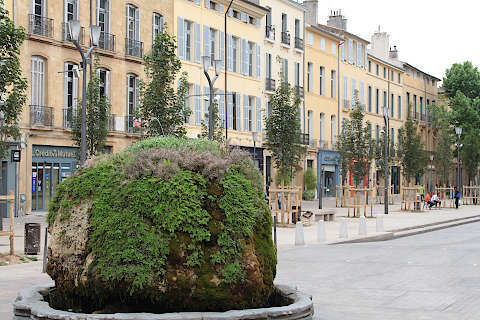 As well as these monuments, it is the numerous speciality art shops, boutiques and cafes, cake shops and chocolatiers, that make Aix such a pleasure to explore: lovely to look at even if you don't want to spend all day eating and shopping! 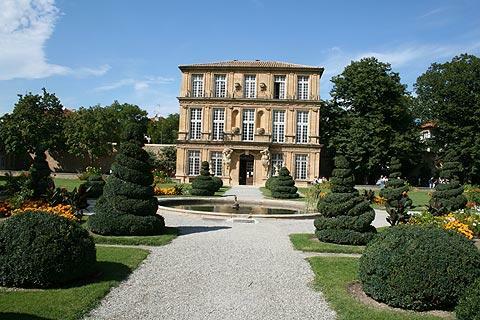 A short distance north-west of the centre, the very lovely Pavillon de Vendome is a grand house built in the 17th century for the Cardinal de Vendome and with an equally perfect garden to the front. 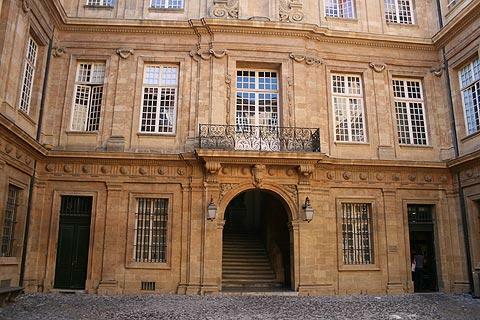 The directions to the house are not very well signposted but it is perhaps the single most impressive building in Aix-en-Provence and well worth a visit. There are plenty of benches around the garden to sit and recover from walking the streets if you get lost on your way here! 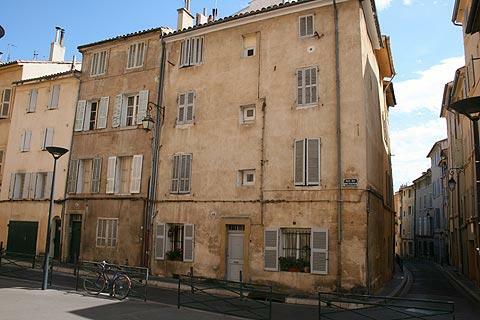 Art enthusiasts will also want to visit Cezanne's studio in Aix-en-Provence. This is a short walk from the cathedral and has been preserved as it was a century ago at the time of the artist's death. The Cezanne theme continues at the Painters' Park (Terrain des Peintres) just on the edge of Aix-en-Provence and easily reached on foot from his studio. It is here that Cezanne himself as well as other impressionist painters would come to paint the surrounding landscape and the views across the Mont Sainte-Victoire. 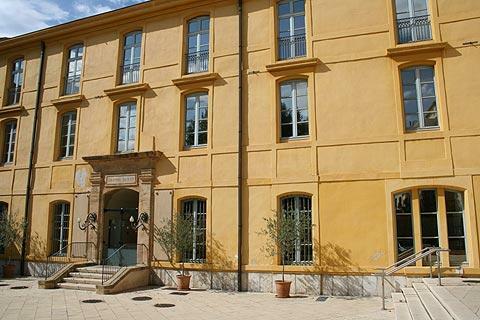 The Aix tourist office have a useful leaflet with a trail that follows in the footsteps of Cezanne in the town, from birthplace to cemetery, and is a fascinating way to explore for enthusiasts of the artist. 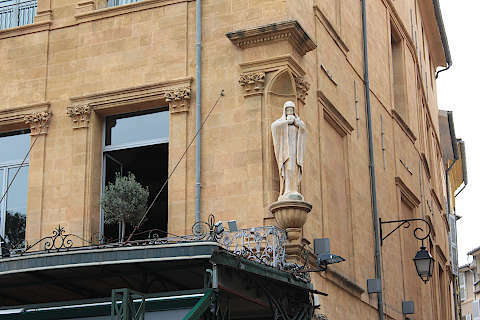 Also in this part of the town is the original site of Roman baths, called Thermes Sextius. There is now a more recent spa facility on the site but if you stroll into the entrance you can see part of the original Roman baths. 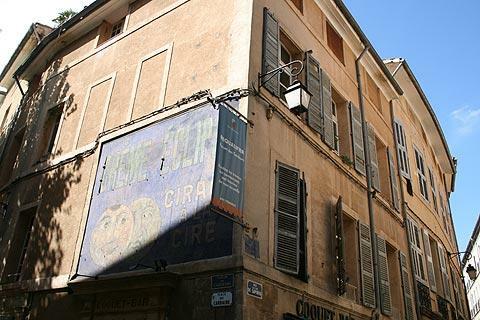 There are various places of interest in the area around Aix-en-Provence, although the most popular are all about an hour drive away. For lovely villages and scenery we suggest you travel north to explore the beautiful Luberon region; for another important Provencal town you can visit Arles to the west. For one of the most colourful cities in France travel south to Marseille; and for a charming coastal town with a beach and the chance of a boat trip along the calanques of Marseille (beautiful!) 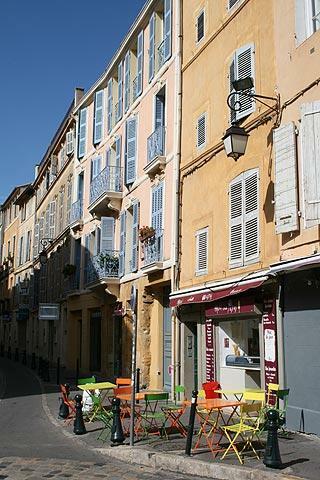 we suggest you travel south-east to Cassis.